A Houston man was critically injured in a motorcycle accident on Highway 288 in south Houston. The man was travelling at a high rate of speed very early in the morning when he rear ended a car. The motorcycle burst into flames. According to authorities, he wasn't intoxicated, but he wasn't wearing a helmet. This accident illustrates how serious motorcycle accidents can be. Cars and trucks have an outer shell that protects their occupants that motorcycles obviously do not have. When a rider also fails to wear a helmet, as occurred in this case, any minor accident can be deadly. Unfortunately for motorcycle riders, many drivers do not see them. Distracted driving is becoming an epidemic across the country, and many drivers are too busy talking on cell phones, reading, eating or interacting with passengers to notice a motorcycle. This can lead to catastrophic injuries or death for the motorcycle driver. 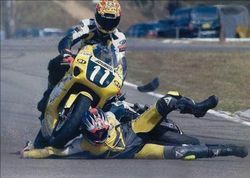 If you have been involved in a Houston motorcycle accident, you should consult with an attorney as quickly as possible. You only have a limited time in which to pursue your claim, and it's important that an attorney get involved early in order to gather evidence, interview witnesses, and negotiate with insurance companies before too much time has passed. It's also important that you not sign anything or take any payment from an insurance company. Although you may desperately need the money, once you sign any documentation, you will be unable to receive compensation for your accident in the future, even if other health problems arise. If you're in Houston and have been injured in a motorcycle accident, call the Houston motorcycle accident attorneys at Kennedy Hodges at 713-489-9493. We will be happy to help you with your claim. Call us today or visit us on Twitter.